The EEI/NRDC announcement recommends several changes for regulating utilities. These changes are intended to incentivize utilities to deploy more clean energy while remaining financially sound. A key factor for getting the utility business model right is correctly setting the rules for pricing distributed generation. Today many utilities use net metering to pay rooftop solar owners for the excess electricity the solar panels produce. The net metering rate is typically set at the full price the utility charges for electricity, or at the utility’s wholesale cost of electricity. Neither measure fully reflects the costs and benefits that rooftop solar provides to the electricity grid. Getting the new utility business model right depends, in large part, on setting the correct pricing for distributed generation. To read this full blog post, please visit Environmental Defense Fund’s Energy Exchange. Is net metering a fair system for compensating owners of distributed generation? What are some of the benefits that solar distributed generation provides for the grid, and what costs does it impose? Most States already charge both transmission and distribution fees as part of the electric utility bill. So now, utilities want to add on yet another fee for those ratepayers that provide electric power midday when air-conditioning loads are highest? Electric utilities and State regulators also have to face the fact that if they pass arbitrary fees, customers may adopt solar and other distributed energy options with storage (batteries) and substantially reduce electric loads. Former US energy secretary Steven Chu has claimed battery storage technology used in combination with solar could be “as disruptive to electricity distribution and generation as the internet”. According to Chu, in order to remain competitive, utilities need to respond by applying a new business model to prepare for the likely coming of cheap solar power and falling prices of residential storage batteries. The idea to assign additional costs beyond what every ratepayer pays, is not fair and will drive customers away further. What is the difference of reducing electric loads with LED light bulbs, geothermal heat pumps, solar water heating, or solar electricity (photovoltaics)? What they have in common is they are reducing electric loads, and when the ratepayer buys electricity they pay distribution and transmission fees incorporated in their bill. Time to confront this obfuscation, and address the issue of re-setting the “carrying” costs for every ratepayer to keep transmission and distribution lines regardless of why choices are made in the building or behind the corporate or facility fence. The users that rely more on the electric grid should pay their commensurate share not the other way around. I agree that regulators should identify the benefits that distributed generation brings to the grid, and pay the DG owners for those benefits. By the same token, DG owners should pay for the costs they impose on the distribution grid. Net metering doesn’t account for these costs or benefits. As the number of net metering customers has increased, utilities are seeking a more precise accounting of these costs and benefits. Several states are starting to address the issue, such as Arizona, California, Colorado, Minnesota and North Carolina. 1. The game changer is distributed dispatchable generation, not distributed intermittent generation. The missing ingredient to transform the electrical world is economical, high-energy density, high-power density, long-lifespan, safe electricity storage. It’s day has not yet come, nor is it yet near, despite another bubble brewing in fuel cell stocks at the moment. The performance numbers for batteries and capacitors and fuel cells are still an order of magnitude and more behind the energy storage 0f fuels, and the tech is stubbornly not following the Moore’s Law profile of computer chips. 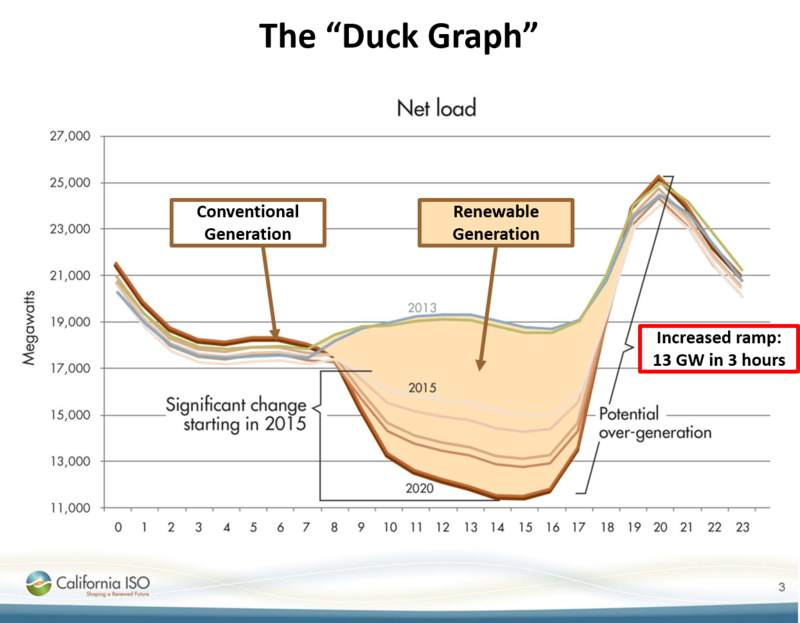 Intermittent “renewables” without storage are a completely different proposition than “renewables” with storage. 2. Solar power peaks are not coincident with either winter or summer demand peaks, despite the misleading comment about renewables providing “electric power midday when air-conditioning loads are highest.” Non-coincident peaking power would be of some net value if was curtailable and supplied on a take-it or leave-it basis. But as must-take power, it imposes more of a burden than a benefit. I guess I’ll have to dredge up the Duck Curve again. There is no economic benefit to the utilities in forcing them to ramp down competitively-bid wholesale power delivered to their substations during mid-day to make room for must-take retail-priced power from residents self-congesting their distribution grid with simultaneously unwanted surplus power. 3. Attempting to equate energy efficiency (reducing one’s electricity consumption), and net-generation (randomly backfeeding unscheduled, must-take, subsidized electricity to the grid and making the utility pay you for the privilege of disposing of it) is a logic failure. The first case reduces the load on the grid, the second makes it do backflips. I agree that storage would be a game-changer for distributed generation. Tesla’s announcement of a $5 billion dollar battery factory may be an indication that the arrival of commercially viable storage could be here sooner than we think. As to the value distributed generation provides to the grid, even without storage, studies from the Regulatory Assistance Project, Rocky Mountain Institute and the Minnesota Department of Commerce, among others, have addressed this. A benefit that distributed generation provides to the grid is that to the extent the home or business is using its own solar system it is not straining the system by pulling electricty from power plants. It appears the costs to the grid is that a home or busienss with its own solar system still needs to be connected to the grid for electricity at night or in the event the solar system goes down. It is arguable that small fee should be collected from the home or business for this “back-up” service, but to me it is not a justification for eliminating or materially changing current net metering policies. The rates a utility customer pays are based on the average cost for the utility to serve an average customer over the course of the year. Net metering customers don’t fit this model. They only use the utility service when they need it. The utility company incurs costs to stand by to serve these customers on a 24 x 7 basis and net metering customers should pay these costs. At the same time, net metering customers should be credited for the benefits they provide to the distribution grid. The premise of the posting seems misplaced. Duke Energy’s exit from the merchant power business seems unrelated to the regulated utility business. If there is a corelation, the author should explain it. The Merchant power industry sells to the utilities, presumably at a competitive price. Just how can this cause the Utility business to “crumble”? If the Merchants did not exist, the Regulators could authorize the Utilities to generate the needed power supply. The existing grid based system continues to enjoy the economy of scale. Current trends are not jeopardizing that benefit. New large central station plants continue to be built and most of the old ones continue to operate as needed. Retiring coal plants are replaced as needed, mostly with nat gas fuelled gas turbine combined cycle units, capable of operating at 50% / 60% thermal efficiency. Wind and solar unreliability must be backed up by grid operation. Increased operating and construction costs are indeed being forced on the utility industry. For the most part, these costs are off set by low cost natural gas fuel. The remainder is passed on to the ratepayer with the approval of rate regulatory authorities as per the existing franchise agreements. It seems that declining natural gas prices should help, not hurt the regulated utilities in the long run. With respect for the effect of distributed energy on grid operation, they benefit each other. My thought was that Duke’s merchant business and their utility business face the same type of challenge – how can they recover their operating costs and earn a return as increasing amounts of renewable energy are added to the system? Duke’s merchant plants compete in the PJM market with wind resources which will supply power even when prices are negative, in order to earn the production tax credit. Duke’s regulated utility business must pay net metering customers either the full retail rate or the wholesale power rate (depending on jurisdiction), which may not fully reflect the cost to serve these customers. Sorry, I still do not get it. I certainly do not believe that renewables have carved out a substantial piece of the market. Whatever contribution they have made, seems to have been off set by diminishing coal fuelled generation. Wind and solar are still relatively minor contributors to the grid, and they must be backed up with reliable conventional generation capacity. I have no inside information regarding the Duke decision, however it is clear that the Merchant Power market is very competitive, and there is substantial risk to be undertaken. Risk is an anathema in the regulated power business culture. Maybe Duke Management does not enjoy dealing with so much uncertainty. The Merchant Power folks get their money by winning intelligent competitive bids. The regulated utility simply identifies their costs and the ratepayer covers them to the extent approved by the state regulatory authorities. Two very different worlds. Many of the merchants have been through at least one bankruptcy. I am rarely the one to bring up a social justice perspective to conversations. The question should not be whether net-metering is a fair system for compensating the owners of distributed generation system, but whether net-metering creates unreasonable cost shifts to ratepayers who do not own distributed generation. Distributed generation creates real benefits for the grid and for ratepayers – including deferring new utility investment in generation resources. But net-metering also creates costs shifts to other ratepayers who can not install their own distributed generation. New distributed generation does not reduce the existing level of utility rate base (distribution, transmission and generation); but the net metering of new distributed generation reduces its owners’ contribution to the costs of the existing system. Even though the owners of distributed generation continue to benefit from the full suite of utility owned assets (distribution, transmission and generation), their contribution to pay those costs goes down. And because these costs must still be recovered in full from rate payers, recovery of these costs shifts to other ratepayers. The challenge for regulators is to recognize and compensate the owners of distributed generation for the benefits they bring to the grid – including deferred utility investment; but at the same time making sure the owners of distributed generation continue to pay an appropriate share of the costs for the utility to stand by to meet their electricity demand when they rely on grid service. And the social justice aspect? The customers least likely to make the capital investment in distributed generation or benefit from tax incentives are low income ratepayers; why should low income ratepayers subsidize their wealthier neighbors electric bills? One measure of the fairness of a rate plan, such as net metering, is whether it imposes unreasonable cost shifts on other customers. By George Wiseman President, Eagle Research, Inc.
I’m going to speak as a customer with a net metering contract. Utilities did not foresee that IPP would start to become a popular choice, due to consumers wanting home security and being willing to pay the costs to install home power production (and costs have been reducing). 1. Ideally, the IPP would produce MORE than the needs of peak power and further reduce the Utilities costs. 2. IPP promotes a diversified Grid. Diversification is directly related to national, community and home security. Disasters and terrorists are far less likely (or able) to shut down a diversified Grid. 3. Smaller power systems may not be as efficient as a large one (although that’s no longer automatically true) but a diversified Grid eliminates T&D losses associated with a centralized Grid. 4. Small power systems can take advantage of local (often renewable) resources. Those facts are still in place so, to me, it looks like the Utilities are trying to have their cake and eat it too. They like having the IPPs because IPPs save them money, but they resent losing the ‘income’. They are not looking at the ‘bigger picture’ of a diversified Grid that is far more resilient to calamity than centralized power plants. They’ve been riding the gravy train for so long, holding onto an obsolete paradigm of centralized power plants, not re-investing their profits into infrastructure and depending on the wasteful habits of North Americans, that they’re now in a bad spot and looking for any way out. They will try lots of options; but I’m thinking that this time, the people will ‘speak’ with their pocketbooks. Utilities that figure out how to support the IPPs and effectively diversify, will thrive. A thought: How about the customers ‘buy’ their Utility and run it themselves? Some Utilities are co-ops. I know that Utilities need to do a complete restructuring to handle a diversified Grid, but isn’t that one of the reasons for so called ‘smart meters’? In my opinion, anything less than full net metering is the exact opposite of what they should be doing. Mostly, it’s difficult to get a net-metering contract anymore, the Utilities want to pay only the government mandated T&D losses (which they skew low when negotiating with an IPP). And so called ‘smart meters’ do NOT record power put into the Grid (they don’t rotate backwards like the old analog meters did) and this eliminates the ‘non-contract’ guerrilla net metering. So, for a lot of IPP, the ‘net metering’ question is moot; they don’t have it anyway. I could see Utilities charging a ‘net metering IPP’ a fee to ‘use’ their Grid, like they do with lots of ‘Green Power Producers’ that wheel their power through the Grid but the fee should be minimal because IPPs are a greater asset to the Grid (and national security) than they are a liability to the Utility profits. To address the suggestion that IPPs ‘need’ to pay their ‘fair share’ of the infrastructure expenses; the Utilities are ALREADY gaining more than it ‘costs’ them. An IPP provides energy to cover some/all/excess of their usage, becoming less of a load to a net gain in power. This power feeds their neighbors, reducing the ‘cost’ that the Utility pays to ‘service’ that neighbor by the T&D losses and the peak generation costs (likely as much or more than the ‘net metering’ loss). Personally, my home is designed with a battery bank, so I can charge it at night during low TOU ($0.04 per kWh) and run off the batteries (using inverters) during the day. My solar panels would feed the Grid at $0.82 per kWh and are available to me if the Grid goes down. I’ve designed a generator that takes advantage of several locally renewable power sources that will further reduce my dependency on the Grid (I’ve already cut my ties with the Natural Gas Utility). All this can be done at reasonable cost, if a person knows how to DIY. I believe more states will investigate the possibility of replacing net metering with a “value of solar” tariff which quantifies the costs and benefits associated with distributed solar generation, like the tariff adopted in Minnesota. The debate on net metering has become twisted and misplaced. The fundamental issue is: can a customer reduce their electricity purchases from a utility without having to pay a penalty to the utility for them, their customers or social/public purposes. A large portion of on-site solar power (or other) production directly offsets real time energy (kWh) purchases from the utility, so solar power, energy efficiency, turning off lights, turning down thermostat etc. simply reduce kWh purchases and if enough customers do these things, all of the bad things predicted to happen to utilities in the EEI report will happen whether solar is the driver or energy efficiency. And if the reaction is that people who are reducing their electricity purchases need to pay some fixed or other charge to the utility, then we establish a policy when you buy a more efficient refrigerator it will be attached to a “lost revenues” payment you need to make to your utility because you are buying less. The one differentiation of solar is that net metered power has the ability to put power onto the grid. But carefully note that the opponents raise this difference but then attack ALL of the solar production and measure utility impacts not just on the exported power but ALL of the kWh produced. So lets say we put restrictions on solar power exported to the grid or pay less for this power. A smart solar customer then installs a battery and the solar power (which is also peak power) they formerly provided to the grid under net metering is now stored for that customer to use at night. Or the customer installs a smaller solar system that produces less clean energy. Or the customer moves more of their loads into daytime when their solar is producing. In direct opposition to what grid operators and policy makers have told us for years, with no net metering, solar customers run their dishwashers, dryers, etc. during peak times, so they don’t export any of their power to the grid. In all of the above scenarios, the sales/revenue impact on the utility is the same as net metering but we implement a policy that takes verv valuable peak power and says instead of sharing with the grid, find a way to keep it off the grid. Not consistent with good policy, good grid operations, or the economics for other electric customers. Long term, storage plus solar will give solar customers the option to forgo net metering. Even when that happens, it will be far better for the grid and other customers to encourage those solar plus storage customers to export their excess power to the grid during peak times than their alternative — storing their excess peak production to use in the middle of the night. When that happens, we might find, just like nearly all of the comprehensive analyses have shown, net metering is a pretty fair deal for both solar power owners and other customers and we will encourage solar plus storage customers not to store their excess production but export to the grid under an arrangement where they get a kWh credit for every kWh exported. It is very tiresome to see wind and solar power advocates continue to pretend that there is no difference between wholesale and retail and that all kWh are of the same quality and perfectly fungible. They know better, the utilities know better, and the grid itself cannot be fooled. This is exactly the wrong time for EEI and Duke Energy to join this farce. For the benefit of the less initiated, consider the analogy of municipal water services. Cities deliver water to residential customers via a grid of transmission and distribution water lines. The water must be upgraded from well or river water by treatment that adjusts pH, adds chlorine and flouride, kills bacteria, and removes light and heavy metals and other contaminants. Then it must be delivered on a 24-7-365 basis at regulated pressure through a sealed, sterile system to users on-demand. All gallons of water are not equal. Rainwater that falls free from the sky is arbitrarily intermittent, has a low capacity factor, and is not of municipal quality. It is ludicrous to think that a resident could pump rainwater from their gutters into the city potable water main and get a gallon-for-gallon credit on their water bill. There are two entirely different system for collecting this kind of water — storm drains and sewers, and the resident pays for these services as well, either directly or through taxes. If the resident wanted to compete with the city water department and provide potable water to customers, he would have to bear the costs of upgrading his rainwater to the necessary quality and distributing it himself via truck or his own pipe system. If he wanted to use the city’s water system to distribute it, he would have to pay a fee for his share for the O&M and recapitalization of that system and he would have to enter into a contract with the city for purchase of his water that was competitive with their wholesale costs of producing their own product with the benefits of their economies of scale and density. For kWh of electricity, the analogous metrics of quality are reliability, dispatchability, and capacity factor — all the qualities that allow any generator to confidently bid on the wholesale market for hourly or sub-hourly time blocks. The only way to upgrade arbitrarily intermittent wind and solar power to grid quality is with storage, and that burden of upgrading falls to the generator, not the grid. Using the entire grid for free to buffer and back up and upgrade power from intermittent generators that produce only a tiny fraction of the net power, and destabilize the grid with its low quality in the process, is a huge miscarriage of economic justice. Electricity without storage is a blessing only when it instantaneously happens to be needed right where it is, and a curse at all other times when and where it isn’t. Simply generating excess, uncontrollable power at a residential meter does no one any good. Electricity is instantly perishable without storage, and, once generated, it is a hot potato that must be instantly handled or someone gets burned. Routing a pop-up kW of intermittently available, diffusely-generated, low-capacity factor, seasonal, non-coincident peaking, self-congesting, power to a happenstance customer of opportunity across town who happens to need it exactly when it is created is quite a feat. If that customer doesn’t coincidentally happen to appear, than the grid must make room for that kW by instantly ramping down a reliable and dispatchable power generator. Either of these two cases are costly services. If the owner of a residential solar panel wants to enter the wholesale power generation business, he must play by the wholesale rules on a level playing field, and must accept the price that his lower quality power brings or pay to upgrade it himself. Expecting the grid not only to provide these services for free, but to pay retail prices for the privilege (i.e., net metering) is ludicrous. Net metering is also regressive economics where the rich get to socialize their costs to the poor. Besides its role in stabilizing and distributing power, the grid is also the vehicle that uses economy of scale (not an obsolete economic force BTW) to deliver electricity to customers in rural areas where the meter density isn’t economical to support otherwise. Net metering essentially forces the utilities to pay retail for wholesale power, and to take it any time, day or night, whether they need it or not. This tail wagging the dog is very hard on existing capital, and even requires the installation of new capital such as new thermal generation and new power lines on the grid to accommodate it. Every rich person that decides to install renewables in their home and socialize the cost of their necessary storage to the grid rather than purchase their own fully sufficient off-grid backup capacity, socializes those costs to the poor who can’t afford to install renewables. Driving up electricity prices for everybody increases energy poverty, leaving the poor holding the bag for the uneconomic lifestyle choice of the rich. This is bad policy, bad economics, and bad politics. Solar and wind bring no benefit to the utilities from “deferred utility investment.” Accommodating intermittent generation has actually required accelerated utility investment. 2,300 circuit miles of new transmission lines were constructed per year, on average, over the last 5 years; 18,700 circuit miles are planned through 2015. Virtually all of this is to bring new “renewable” energy capacity to the grid during a time when nationwide power demand is flat and no new capacity is needed. For example the $6.9 billion CREZ in Texas ($2 million per mile) built to connect future wind in west Texas to load centers in the east, and the $1.9 billion Sunrise Powerlink ($16 million per mile) built to connect San Diego to non-existent RE projects in the Imperial Valley. And these projects were both being funded by public utility commission-approved surcharges on rate payer’s bills that guaranteed a return to the utilities because the business case itself could not justify the money spent. “Renewables” have also accelerated spending on non-renewable generation. Not only are the peaks from solar and wind power generation not coincident with peak demand, they may not even materialize at all on a given day. Thus, no existing dispatchable generation capacity has been truly displaced, but must be kept in reserve for back-up. The requirement to buffer the intermittency of wind and solar generators in fact creates a need to increase thermal generation capacity — hence the common pairing of new wind and new natural gas combustion turbine generation. Lawrence Berkeley National Laboratory in 2012 found the perpetual integration costs of wind capacity on the grid to be averaging 0.6 cent per kWh and requiring the addition of 15% of wind nameplate capacity (50% of actual wind output) as rapid ramp-rate thermal generation for buffering. Adding wind and solar requires us to increase rather than decrease total thermal capacity on the grid. To see why, the CAISO “Duck Graph” is informative. Since California power demand peaks about 7 pm in the summer and solar peaks at noon and is declining rapidly to zero about 7 pm, this mismatch creates a need for thermal generation to ramp down during the mid-day and rapidly ramp up in the evening to compensate. The higher the penetration of must-take solar, the greater the ramping burden for dispatchable generation. This is no way to run any fueled power plant efficiently or economically or to maximize its lifespan. Reality puts the lie to claims of coincident peaks and to claims that utilities gain some peak-shaving benefit from must-take solar and wind and can’t get enough of them. Rather, intermittent renewables are like petulant children that peak when they feel like it (or not) and make the adults of the grid clean up after them. Several years ago when Dominion Power first introduced the ‘standby’ charge – a fee paid to remain attached to the grid, I spoke against it. A standby charge seemed to be punishment for doing a good thing, like the additional assessment the Virginia Legislature levied on fuel-efficient vehicles in order to make up for the loss of gasoline tax revenue. RMI’s early work with utilities described the validity of the utility’s argument for stand-by charges. When distribution charges are included in the rate structure the costs of maintaining the grid are shifted toward those who must use the grid. The smaller base created by the drop in demand means increased rates. Today, I am surprised that we are not talking about the structure recently defined in MN that builds on the ‘Value of Solar’ started in Austin, TX. While the utilities fight against net-metering the Minnesota structure appears to be a fair and honest effort at accurately replacing net metering. Minnesota’s new law was structured by a large group of stakeholders including utilities, solar installers, non-profits, including RMI, IREC and the Environmental Law and Policy Center. The process for determining the Value of Solar includes 3 main points according to VoteSolar. The tariff, or guaranteed price is calculated over the life of the asset, 25 years for solar panels. Like a Power Purchase Agreement a value in included for avoiding any fossil resource price fluctuations. Finally, the VOST (Value of Solar Tariff) formula includes a comprehensive ‘environmental cost’ category. Like the EPA’s Social Cost of Carbon, cost calculations are done for a variety of pollutants. Within 30 years, sooner in many places, solar plus battery technology will be cost competitive with grid power. If the utilities and their grid are to thrive they need to find value in distributed energy. One way might be to reward customers for siting their panels in a way that produces the most power at peak time. Such a siting might actually diminish the total power generated, but it would serve a supply/cost reduction purpose for both the company and, by extension, its customers. Another might be to finance customer on-site production purchases and provide annual maintenance contracts. A third might be to install energy managements systems for their customers. All of these examples mean the utility can find ways to provide services to their customers. So far utilities have thought mostly about the inevitable reduction in demand and its potential death spiral. They need to stop thinking about just selling a commodity, electricity, and begin to find ways to provide services to their customers. And their regulators need to separate cost recovery from commodity sales in their rate regulation rules. When they do utilities and their local renewable generators can begin to work together. Ike Kiefer makes a pretty good case that net metering is unfair, and I generally agree with him. But there are a couple of points that soften that position. They have policy implications beyond just the question of net metering, and policy makers should be aware of them. First, while it’s true that the rational value of “must take” intermittent renewables is capped by the cost of the fuel that they displace — and is actually less, due to the inefficiency of ramping and the toll it takes on equipment — it should be noted that the cost of that fuel does not include the external cost of its CO2 emissions. There’s a reason we collectively decided that non-fossil energy resources were worth subsidizing. A lot of things would be simpler if we would bite the bullet and adopt a fossil carbon tax that internalizes those external costs. Then we could let the markets efficiently sort out the consequences, as markets tend to do. Any policy that does not start with a realistic carbon tax is merely a band-aid for our political failure to price carbon emissions. Second, the cost of intermittency isn’t (or needn’t be) quite as bad as what Ike portrays. It’s true that the predominant means of backing intermittent renewables is with dispatchable thermal peaking units. Those are significantly less efficient than baseload units, but low capital cost makes them the most cost-effective solutions for intermittent operation at low duty cycles. However, dispatchable generation is only one of three general approaches for dealing with variability. The other two are energy storage and load-based regulation. Energy storage is often taken to mean battery energy storage. As pointed out, battery storage is currently too expensive to backing distributed wind and solar for more than minutes at a time. But there are other storage technologies that could be economical for truly large-scale energy storage. They are currently neglected. Load-based regulation is also neglected, though it has the potential for being the cheapest and most efficient solution for balancing supply and demand. Commercial refrigeration units are examples of loads that, within limits, can be run when there is surplus power available, and curtailed when there is a shortage. It requires only an appropriate control interface and a regulatory system that recognizes their ability to provide ancillary services. In most locations, commercial refrigeration won’t account for enough load to be of much help. However, if policies that encourage load-based regulation are adopted, there will be plenty of applications that could serve. One that is being pursued in Europe is electrolysis of water into hydrogen and oxygen. What’s done with the gases can vary. In the simplest case the oxygen is vented and the hydrogen is stored to power fuel cells. That makes the approach an energy storage system. It has the potential for very large storage capacity, but round trip efficiency is low (~ 50%) and the capital cost is high. Not the most attractive large-scale storage option, but one that is at least well understood. There are more creative ways to employ the electrolysis gases. Some of those ways, I believe, would be much more cost-effective than venting the oxygen and storing the hydrogen for power geneation. One that I like would use the hydrogen to make ammonia, while the oxygen would be used for power generation by oxy-fueled combustion of municipal wastes. The bottom line is that there are multiple paths that could lead us toward an energy economy in which intermittency is no big deal. In such an economy, the value of kilowatt-hours would be much less variable over the course of a day or week. Something like net metering would then make more sense. But it will take planning, appropriate regulatory structures, and policies that nurture requisite technologies and business models before we can get there. Point 1. My analysis above is not specific to battery storage. The cheapest storage today is pumped hydro, and that is what was calculated in the Weissbach 2013 study that still finds PV solar and wind to have too low an EROI to be economical. What renewables advocates and all others need to understand is that, when cheap storage arrives (via batteries or capacitors or fuel cells or pixie dust), it will benefit all generators and all grid customers, not just intermittent generation. It will allow thermal generators to operate more in baseload profile and allow consumers to levelize their demand profiles, flattening peaks and their associated price extremes. It improves every generator’s competitiveness and reduces the value of dispatchability at exactly the same time it delivers improved dispatchability to intermittents. In other words, its not a magic tipping point just for renewables that will usher them into unrivaled dominance. Point 2. While carbon is not costed in the price of fossil fuel generators, neither is it properly costed in the price of wind and solar renewables that all begin their operating lives with huge carbon debts from the fossil fuel energy used to mine their constituent minerals and smelt their steel and kiln their cement and melt their glass and bake their microchips and forge and mill and fabricate and transport and erect their thousands of acres of panels and modules and towers. This energy must be the high-intensity, high-power density type that fossil fuels provide, not the low-power density energy that wind and solar provide. The sun and wind are free, but the devices that capture their energy must be renewed every 20 or 30 years, re-incurring their fossil energy carbon debt. This is why calculations of comparative lifecycle carbon costs come down to comparisons of lifecycle EROI. If we simply required that all wind turbines and solar panels be made exclusively using wind and solar power, it would quickly demonstrate the crippling EROI and power-density shortfalls. Same if we mandated that all cultivation of biofuels be restricted to biofuel energy. If we remove the external huge fossil fuel inputs, both of these efforts collapse into the snake eating its own tail. Point 3. I am all for costing externalities into energy. But, as I’ve elaborated in this forum before, we must cost them all and do it equitably, or we will simply channel behavior from one harmful activity to another that is worse. For climate purposes, we need to price CO2, but also proportionately price methane (34 times worse than CO2, released from food and biofuels agriculture and landfills), nitrous oxide (298 times worse than CO2, number one ozone-depleting gas, released from fertilizer manufacture and use on food and biofuels), nitrogen triflouride (17,200 times worse than CO2, released by solar panel and microchip manufacture), sulfur hexaflouride (23,900 times worse than CO2, released by manufacture of semiconductors, waveguides, and magnesium), etc. If we are not prepared to demonize ammonia fertilizer and microchips to reflect their proportionately much more devastating global warming potentials and suffer the economic consequences of greatly increased prices for food and technology, then we are going to continue with insane policies like RFS2 (that even the EPA admits has actually increased pollution and GHG emissions over using straight gasoline), and building $19/watt facilities like Ivanpah (that dwarf the project costs of nuclear power plants despite enormous subsidies even before the billions for required new transmission lines and new rapid-ramp thermal generation are factored in). Point 4. We need to consider human mortality as the ultimate social cost. If we do this, we find that there is a linkage between raising energy prices, increasing energy poverty, and increasing the national death rate. The Europeans — especially the UK — are currently figuring this out and it is leading to energy riots. You wouldn’t know it from the media reports or celebrity pundits, but global warming has been a net benefit to the Earth and humanity up to now, and the benefits are forecast to continue to be greater than the costs for another 2.0 to 2.5 degrees Celsius. (This is the climate change community’s consensus, not my opinion, and follows from their integrated assessment models.) Increasing temperatures have increased green plant coverage, increased biodiversity, increased precipitation, and decreased the number of people who die during the cold winter months each year. This “excess winter mortality” far exceeds the number of those who die from heat in the summer. In the UK in 2010, the death rate during the winter months of Dec-Mar resulted in 31,000 more deaths than if the average death rate across the other eight months had prevailed. In 2008, 95,000 more Americans died of cold than of heat. These numbers are a highly correlated mathematical function of energy cost, energy efficiency, and income, which is to say “energy poverty.” As the price of electricity goes up faster than income, the number of people who die in the winter goes up. Only two times in history has the price of US electricity gone up faster than inflation: during the Carter era’s subsidized push for renewable energy and during the current subsidized push for renewable energy. There are very real social costs to reducing carbon that have not been duly considered up to now. Politicians across the Atlantic are already starting to pay the price for their overly-narrow focus on demonizing carbon alone for its poorly calibrated and far-term damaging effects while being blind to the immediate and undeniable devastation that their anti-carbon policies are causing around the world. Prescribing a debilitating cure without first understanding the disease is more malpractice than precaution. I suspect we will be hearing more of this more comprehensive and informed view of the social costs of energy alternatives as the winds of reason carry it across the Atlantic. Several points … in 2010 only 2.45% of our electricity was produced by solar and wind. PJM has just released a report, done with GE, stating that the grid can handle up to 30% integration with no significant reliability issues. The report does mention the issue of ramping to which I would add that the reports from Stanford and University of DE that say we an produce almost 100% of our electricity from renewables rest their case on a wide distribution of many kinds of renewables. The main factor in lessening the intermittency issues related to solar and wind is a wide variety of sources spread over a wide area. It will take time for the wind and solar industries to develop. Offshore wind is barely underway in the US. We can expect that by the time that we reach the magic 30% we will have met a lot of peak energy requirements through solar and will have additional technology and extensive cost reductions that will make local storage cost effective. Finally, I do agree that a carbon tax is the easiest way to go to achieve some cost leveling for both climate and clean air and water, but I don’t see that happening any time soon. I am looking forward to Exxon’s environmental risk assessment, which they plan to release soon. The EDF has addressed the investment risk issues and Ceres and Carbon Tracker have made great arguments for a new evaluation of the risks involved in continued investment in fossil infrastructure and exploration. As you and Mf. Finnigan state, not only are regulatory changes in order but so are changes to business models that reward excess capital investment. The changes will take a lot of time, especially here in the US with no national consensus for decarbonizing. The authorship of the 30% penetration study is GE Energy Consulting, not PJM. As just one tiny example of the absurd assumptions made throughout, they only modeled the necessary regulation services to cover 99.7% of the power excursions from 10-minute interval, smoothed, aggregated intermittent power production. 10-minute interval averaged data does not show the impact of clouds and wind gusts that can cause localized or even broad area 0-100% short-period fluctuations in actual performance. 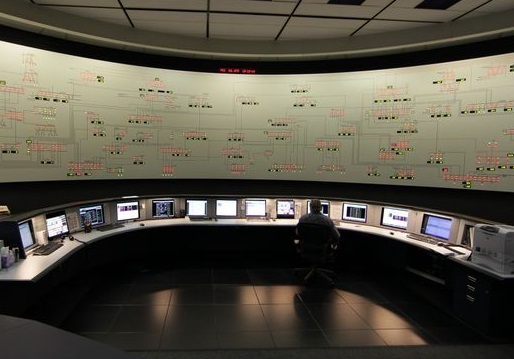 But, even if that that data was taken to be perfect, a value of 99.7% reliability allows for 7 times more variance than the current grid reliability of 99.98% and would equate to 11 hours of outage time experienced over many random episodes a year instead of the current single episode of less than 1.5-hr duration that is typical for American grid power consumers per average SAIDI/CAIDI. And even then, their analysis indicated the amount of contingency reserve under a 30% intermittent penetration scenario would be doubled from what it would be for the same load from non-intermittent generation (increased from 1.2 GW to 2.2-2.7 GW). PJM and the rest of the nation should expect to maintain or improve grid reliability, not accept a decline, and we need to see the numbers for replacing like energy services with like energy services and have them recompute for 99.98% reliability contingency reserve. GE’s claims of economic savings (even after admitting they did not do a thorough economic analysis) are based on inflated prices for natural gas ($8.02/MMBTU) and coal ($3.51/MMBTU). Their GHG emission savings are based on operating phase comparisons, not lifecycle comparisons. The devil’s in the details. Capacity factors declined since 2007 and are now flat. Not increasing as expected with rotor and hub height scaling trends. Average new install site Wind Resource Quality Index has decreased from 96 in 2000 to 76 in 2012, canceling out the performance gains of turbine upscaling. 2,300 circuit miles of new transmission lines were constructed per year, on average, over the last 5 years; 18,700 circuit miles planned through 2015. And virtually all of this is to bring new “renewable energy capacity” to the grid during a time when nationwide power demand is flat and no new capacity is needed. For example the $6.9 billion CREZ in Texas ($2 million per mile) built to connect future wind in west Texas to load centers in the east, and the $1.9 billion Sunrise Powerlink ($16 million per mile) built to connect San Diego to non-existent RE projects in the Imperial Valley. And these projects are both being funded by public utility commission-approved surcharges on rate payer’s bills that guarantee a return to the utilities because the business case itself could not justify the money spent. At 10% penetration and a 15-minute scheduling market, for every MW of wind nameplate capacity added to the grid, it is needed to increase the reserve capacity by about 15% of that value. When considering that wind delivers only 31% of name plate, the reserve capacity is actually almost half of the delivered energy. The ratio increases with increasing penetration and decreases with “quicker” scheduling. The GE “study” was based on PJM’s 4-5 hour-ahead scheduling, which should have resulted in even higher reserve capacity requirements if it had been done realistically. Based on my recollection net metering did not used to be fair to small distributed generation. Maybe that has changed. So I pray. Oh Dear! Thanks for taking the time to respond and you are right … the 30% with no major grid issue was written by GE Consulting as I recall, but it was done for PJM. I haven’t found the cite. Sorry, but I do remember that the same statistic has been quoted before by NREL and by RMI. The other part of my comment referred to 2 studies, one from Stanford, which required storage in some measure and the other at the University of DE and DE Tech. Here is some of a press release … the principle designer is Willett Kempton and I think somewhere I have called him Mr. Willett. Is that what you were commenting on? “Wind, solar power paired with storage could be cost-effective way to power grid 8:51 a.m., Dec. 10, 2012–Renewable energy could fully power a large electric grid 99.9 percent of the time by 2030 at costs comparable to today’s electricity expenses, according to new research by the University of Delaware and Delaware Technical Community College. ‘Aiming for 90 percent or more renewable energy in 2030, in order to achieve climate change targets of 80 to 90 percent reduction of the greenhouse gas carbon dioxide from the power sector, leads to economic savings,’ the authors observe. That price of gas is within the range others are using … the top estimate being a little over $9. Pew has very good market reports. They just put out a very through new global report, and I particularly like Bloomberg New Energy Finance. As you know I have a lot of trouble with comparative cost data … because of the very large externalized costs of fossil fuels. The Harvard study that quantified externalities for coal came up with and additional per kw/hr cost, depending on a variety of things, of $.09-.27. At the top that is almost be triple! Minnesota has just adopted a Value of Solar Tariff to replace net metering that quantifies a lot of things. Interesting inclusions. Take a look. Finally … demand has been flat and new grid connections for offshore and central wind corridor are required. I have also just read that CA could pay less for their power if a connection was built to Wyoming’s wind. It is also true that as demand will be flat for another year or two this looks like a good time to continue closing those 40+year old coal plants and try to lower the peaker requirements with more solar. Our air and water will sure get better! Buried in all the material you provided above is the very dramatic assumption of cost-effective, high-capacity energy storage. With this pixie dust we can make pigs fly. However, it doesn’t yet exist and it is not on a glideslope to exist by 2030 or even 2050. The ancient lead-acid battery is still a viable competitor with the latest technology for some applications. Today we can store a kWh of energy in 3 ounces of diesel fuel for 10 cents, but it costs $500 in LiON batteries that weigh 30 lb. There are stubborn principles of physics and chemistry that describe why it is easier to store energy at high density with electrons in the inter-atomic bonds of hydrocarbon molecules instead of in the valent orbits of semi-conductor crystals or the ions in electrolytes. Today’s options for affordable storage of sufficient capacity to upgrade even existing solar and wind installations to grid dispatchability standards are none. The closest contenders are pumped hydro and compressed air, which are both very geographically and capacity limited, and still not competitive with dispatchable fueled generation except in peak-shaving roles. Spending a dime on pushing any more wind or solar onto the grid before the storage solution is here is wasteful, counterproductive, and harmful.